This paper presents a finite element parametric study of several variables that affect the stiffness efficiency of rigidly capped pile groups with a view to developing a solution for preliminary design purposes. 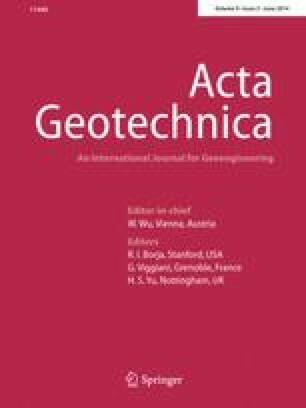 Previous empirical solutions from linear elastic work had identified a significant dependence of stiffness efficiency on pile group size and group spacing, and in this study, the effect of the pile length-to-diameter ratio, the compressibility of a stiff bearing stratum beneath the pile group and the depth below ground level to the stiff bearing stratum are also considered. Pile groups in a soft clay/silt are modelled using PLAXIS 3D Foundation in conjunction with a soil model that captures the stress dependency of soil stiffness. The trends from the soft soil study have been formulated into a set of equations which can be used to predict the stiffness efficiency of pile groups. This new approach captures more variables than previous simpler empirical prediction methods and performs better when applied to a database of 29 published pile group case histories. The first author gratefully acknowledges the College of Engineering and Informatics, NUI Galway, for providing a fellowship for this research.